Leon, Mexico, March 2-6th. Sebastien Loeb claimed a fifth Rally Mexico victory on Sunday, driving Citroen's all-new DS3 World Rally Car to its maiden victory in the WRC. The triumph is Loeb and co-pilot Daniel Elena's 63rd success at world championship level, out of 140 starts in the series (that's 45 percent, if you're keeping track). The Citroen Total Team stars began the final day of the event locked in tight battle with teammates Sebastien Ogier and Julien Ingrassia, who were 10.5 seconds ahead. Then in an incredible stroke of rotten luck, Ogier crashed on stage 20, allowing Loeb and Elena to move in front, where they were able to preserve their advantage for two stages until the finish in Leon. The rally gods must have been smiling on Loeb and Elena. Though they ultimately benefited from Ogier's retirement, it wouldn't have mattered had they not fought back so brilliantly after a 50-second time penalty incurred when they were late starting stage 15 following a transmission problem. While Ford didn't lock out the podium in Mexico, the Abu Dhabi World Rally Team did score valuable podium real estate; Mikko Hirvonen and Jarmo Lehtinen finished second in their Fiesta RS WRC, with teammates Jari-Matti Latvala and Miikka Anttila third. 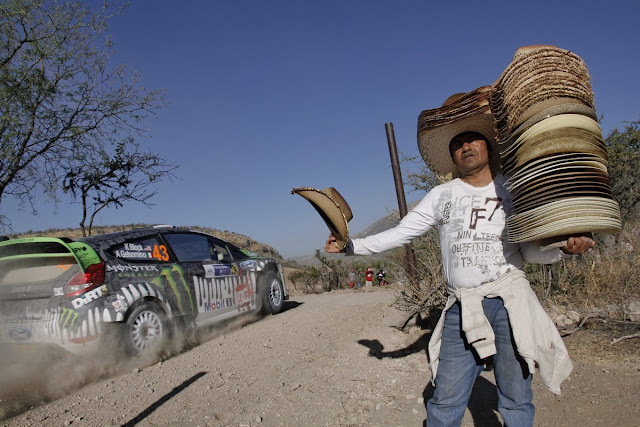 Rally Mexico began with a special ceremonial street stage through the city of Guanajuato on Thursday night. By the end of SS1, Petter Solberg and Chris Patterson had a slender lead of two-tenths of a second heading to Friday's first gravel stage. The 2003 world champion was fastest on the stage in his Petter Solberg World Rally Team Citroen DS3 WRC, emerging through the short tricky city course in a time of 53.2 seconds. Cheered on by thousands of spectators, Solberg just edged Loeb on the stage, held under the cover of darkness, despite reporting nudging a wall in the tunnel section; the damage was restricted to a scuffed tire and Solberg was able to make it to the finish line. Ogier took third fastest in his DS3, and Latvala was fourth quickest in his Fiesta RS. American superstar driver Ken Block and co-driver Alex Gelsomino meanwhile had to contend mechanical gremlins with the Monster Energy Ford Fiesta RS literally just feet from the start line. An electrical issue left the car dead, forcing the pair into a situation where they were too late to start, leaving them to Superrally for Friday morning with a 10-minute penalty. "I'm really bummed about the car leaving us stranded at the start," said Block. "Not only did we miss out on taking part in Rally Mexico's awesome opening ceremonies, the 10-minute penalty has pretty much killed our chances of a good overall finish here. And after all the work and preparation, it's tough to start off like this, but we're here and we are still looking forward to getting back out onto these amazing roads tomorrow." After a late night three-hour service, M-Sport had Block and Gelsomino back in the rally for Friday morning. Ogier completed the two runs over the Super Special Stage at Leon's race circuit with an overall lead of 2.3 seconds heading into day two of Rally Mexico. The 27-year-old Frenchman eclipsed factory Citroen teammate and countryman Loeb, with world championship leader Hirvonen, the top Ford driver, in third. Ogier was fastest on four of the six all-gravel stages, and Loeb was fastest on two. Hirvonen spent day one cleaning the road in his Fiesta RS, indicating it had been a huge struggle to remain in contention. Solberg was on course for completing day one in third place, but an electrical glitch on stage six cost him almost seven minutes and dropped him out of contention. Latvala was fourth heading to the final day of the rally, albeit almost three minutes off the lead after he picked up a puncture on stage four in his Fiesta. Block returned Friday only to encounter another reported mechanical fault with his Ford. Saturday closed with Ogier 11.3sec ahead of Loeb after a wild day that saw Loeb claim the overall lead for a time starting with SS11. With his advantage over Ogier increasing, Loeb prepared to line up for the start of stage 15 only for the car's gear selector pin to break, leaving the Frenchman's DS3 WRC stuck in third gear. 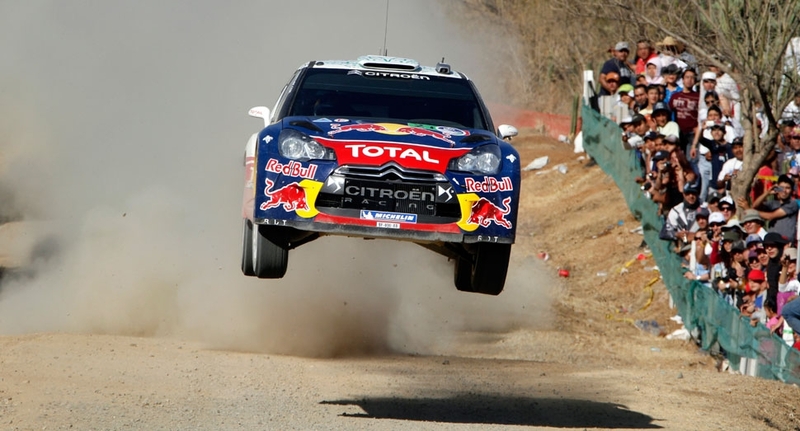 With the stage featuring several uphill hairpins, Loeb knew it would be impossible to complete the stage without making repairs. Although Loeb and Elena were able to fashion a temporary fix, they were five minutes late starting the stage and incurred a 50-second time penalty as a result. Having led by 19.7sec, Loeb now trailed Ogier by 24.1sec after the 15th stage. It appeared Loeb's challenge was done until Ogier's car suffered an intermittent power loss with 3.1 miles of stage 16 left to run and dropped some five seconds. Ogier's misfortune and Loeb's pace meant the gap was down to 10.4sec with one gravel stage remaining. But any hopes Loeb had of trimming Ogier's lead still further evaporated when he stalled on the final hairpin of stage 17 as a result of his car's handbrake not working and lost vital time. Hirvonen in third led the Blue Oval camp, followed by Latvala, who suffered a puncture on Saturday's first test but bounced back with Ford's first stage win of the rally when he went fastest on the second Derramadero run. Block crashed out on Saturday. The deciding moment of Sunday's final three stages came when Ogier left the road eight miles into the Guanajuatito morning test, damaging his DS3's front-left wheel. 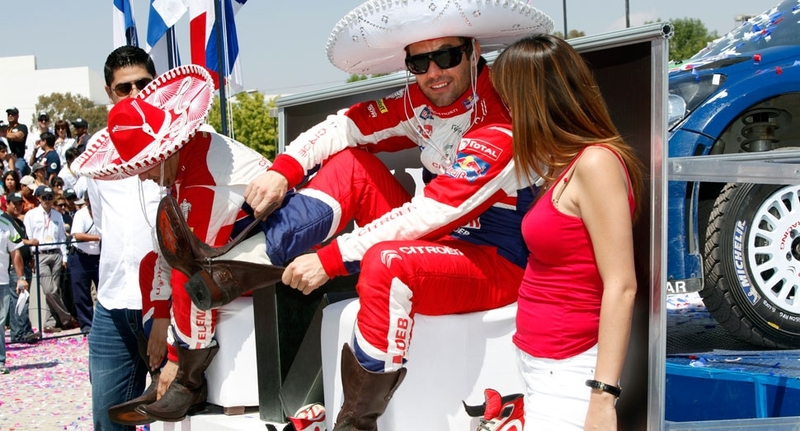 The off gave Loeb a Rally Mexico lead he would not relinquish. Hirvonen also benefited from Ogier's exit to inherit second place. The result means the Finn maintains his lead in the world drivers' championship following his triumph on Rally Sweden last month. He ended the event by winning the Power Stage to secure three bonus points in his bid to become world champion for the first time. Latvala completed the podium in his Fiesta and secured his second stage win of the rally with the fastest time on the penultimate test of the event. Up next for the WRC is the Vodafone Rally de Portugal, March 24-27 in the city of Faro (MFL photography provided by Citroen, Ford Abu Dhabi WRT and Monster WRT).